Designed and implemented mobile and web portals tightly integrated with diagnostic and referral systems for self-service medical care. Designed, developed and managed a complete social network integrated with on-property gaming systems in use at large casinos around the U.S. Built enterprise transaction systems leverage Service Oriented Architecture (SOA) interfaces, enabling 3rd party application integration. 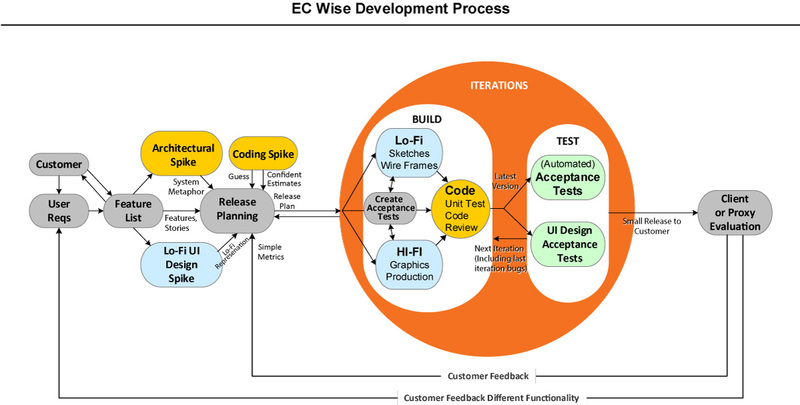 EC Wise’s design and architecture teams have the proven know-how for analyzing and designing sophisticated systems in a variety of domains. We know how to identify and implement solutions for common classes of requirements, feature sets and priorities. Working with your product managers, business analysts and systems analyst we help you define target features, and capture them in a form accessible to all project stakeholders through our collaboration portals. Usability – The user interface must be intuitive (and often aesthetically pleasing) to its target user/audience. Modularity – the solution comprises well defined, independent components, which we now package as microservices, which can evolve independently. Extensibility – New capabilities can be added to the software without major changes to the underlying architecture. Fault-tolerance – The solution is resistant to and able to recover from component failure. Reliability – The software is able to perform without interruption outside of maintenance periods, regardless of changes in loads or other stressors. Security – The software is able to withstand hostile acts and breach attempts. From day one of an engagement our main goal is to determine what will make our Client’s operations more successful. Regardless of the industry, the initial questions are generally the same. What pain are you trying to alleviate? What business opportunities and revenues are you trying to capture? What solution can we deliver that provides a high ROI in the short term? How can we visually organize output to be intuitive and informative to your end users? Our experienced Architecture team will translate the answers into an architectural approach validated by Architectural Spikes and Lo-Fidelity UI Design Spikes. This has the benefit of validating early assumptions and allowing clients refine their requirements based on a better idea of what the end product will look like. We then plan a first iteration that will provide significant business value with results delivered within two weeks. Our development team (usually working out of our Chengdu R&D center) develops functional specifications, implements code, and automates acceptance tests. To find out more about secure application development, visit EC:Secure – Application. As a Microsoft Partner with Silver level Application Development certification, EC Wise has incorporated many aspects of Microsoft’s Secure Development Lifecycle. At all levels we think about how to validate before we write specifications or code. Continuous automation tools build and test changed code automatically, and scan all code on “check-in” to find obvious standards violations and security vulnerabilities, thereby reducing cost and increasing confidence. Key components of our “Bottom Up/ Top Down” strategy include unit testing specific blocks of code against predefined business objectives, integration testing how various functions work to provided business services, and developing “requirements to design” traceability tools.